Where? Right outside the ArtHouse, beside the Lake Country Art Gallery. 10356A Bottom Wood Lake Rd, Lake Country BC. Meet local artists and artisans, collectors of vintage and purveyors of hand crafted curiosities. 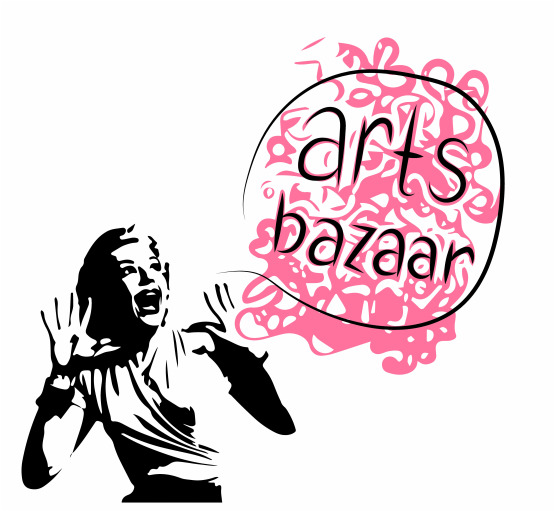 New to the bazaar will be a group of UBCO creative studies students who will add fresh and exciting new ideas to the mix. Eight students are set to rotate through the summer so every month will have its own twist. Also new this year will be Shonek Studios with their colourful ceramic, glass, paintings and more; local illustrator Sharlene McNeill with collectable art cards and a children’s book hot off the press which she will happily sign for you. The kick-off event on Saturday May 2nd will see the return of many favourites including Denise Wandt (Art, cards, gifts, home & Garden wares), Angie Hanson & Farah Canuel (Encaustic art and supplies), Stacey Dean (Earth Haven studio handpainted ceramics), Norbert Spyth (Stained Glass art), Perch Travelling Boutique (vintage clothing & accessories) and of course the fabulous Winfield United Church Bakers with their delicious cakes! Stay a while and enjoy live music, impromptu entertainment or the joy of people-watching on a summer day under the Manitoba Maple Tree. Bring your visitors for something to remember; bring the family and make art with the kids at the Lake Country Art Gallery’s Family Art drop-in from 12:30 to 2:30pm. Take home your art, someone else’s art, a freshly baked cake and something to add sparkle to the rest of your weekend. 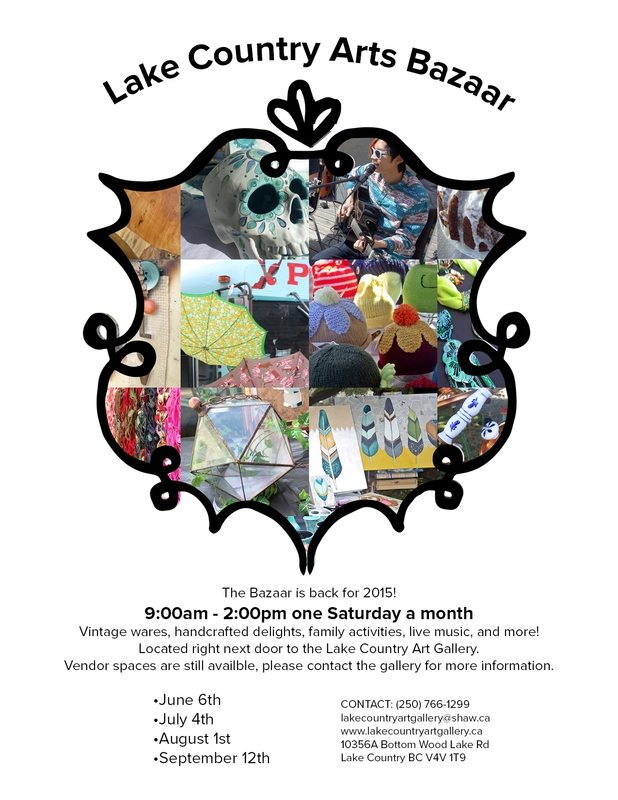 The Lake Country Art Bazaar runs from 9:00am until 2:00pm on Saturday May 2nd, followed by 4 more Saturday dates for the season: June 6th, July 4th, August 1st and September 12th. These events take place at the Art House, located right next door to the Lake Country Art Gallery, this cultural hub also shelters three resident artists plus the Gallery Gift Shop and the Artshelf, the only used Art Book store in the Okanagan, all of which complement the Lake Country Arts Bazaar beautifully. The mix of vintage wares, family activities, artisanal boutiques, glass and other giftware, art books on a variety of topics and outdoor artist galleries were a magical mix at the Lake Country Art Gallery’s first installment of its Lake Country Arts Bazaar. Despite the foreboding looking clouds, attendees, and vendors alike, were undeterred and had a wonderful time. “I was really delighted at the turn-out of our very first Arts Bazaar. It was such a diverse and fun environment. Visitors were swept from curiosities to art items, to face painting, baking, baubles, and even a big blue bus filled with beautiful vintage wear!”, says Art Bazaar organizer Jody DeSchutter. Wares and vendors included: childrens watermelon and strawberry shaped cotton knitted hats from Ladybug Creations; handcrafted 3D paintable puzzles in the shapes like cats,rabbits, dragons and even Ogopogos from Valcraft; sparkle for every corner of your home, garden and person from Jazz Yaz's; face painting and rock painting activities for all ages, plus a wonderful selection of ready-painted rocks to surprise your garden visitors from Elaine's Creativity; and beautifully crafted glassware from Glass Roots Creations and Norbert Spyth. Artist Leane Spanza created her own outdoor gallery studio of large canvas paintings, including one she was actually working on right at the Bazaar. Greeting cards with reproductions of her original paintings made taking home her unique landscapes an easy treat. Winfield Church bakers towered two tables high with delicious cakes and pastries that disappeared faster than free umbrellas on a rainy day. Come early if you want to snag your favourites. Interest in this new event sparked not only the interest of visitors and passersby, but also new vendors. “We’ve had a lot of interest from new vendors since the first Lake Country Arts Bazaar. In addition to the many vendors who will be returning, we’ve also got a number of new vendors booked for Saturday, August 9th”, explains Gallery Manager Petrina McNeill. New Vintage Theatre will also be on hand August 9th, performing a Queen of Hearts skit at 10am. This small troupe of professional actors bring a little more frivolity and a bit of the bizarre to the grounds which is sure to delight. And if this isn’t enough for you, add what the Lake Country Art Gallery offers on a day-to-day basis to the Lake Country Art Bazaar: fine art exhibitions in the main gallery, a gallery gift shop that features original art gifts and cards from 37 local artists and the only art used book store in the Okanagan Valley - the Artshelf. The Lake Country Arts Bazaar runs from 9am - 1pm on Saturday, August 9th at the Lake Country Art Gallery located at 10356A Bottom Wood Lake Rd, right next door to the Lake Country Coffee House, who are the purveyors of coffee for this fine event. This summer, the Lake Country Art Gallery unveils the Lake Country Art Bazaar. A treasure trove of handcrafted and vintage delight awaits perusers one Saturday each month until October at the Lake Country Art Bazaar. This event, hosted by the Lake Country Art Gallery, at the Art House, which is located right next door to the gallery, will feature a selection of creative wares to create a stunning arts bazaar. “I have had it in mind to facilitate a space for creative people to sell their wares ever since seeing the Bicycle Basket Bazaar start from nothing and grow into one of the most popular events not only in it's home town of Northampton [England]”, explains Lake Country Art Gallery Manager Petrina McNeill, who emigrated to Canada from England a number of years ago. “Arts markets have always held a magical place in my heart. Early experiences in London where streets were filled with fine art, popular art, student-designer wear, funky soft furnishings, imported and vintage curiosities, all manner of shiny things and exotic foods each bustling for attention”, McNeill reminisces. Summer student, Jody DeSchutter, who is currently a BFA student at UVIC in Victoria, and grew up in Lake Country is the maestro who is organizing the vendors for these events. “I want to demonstrate just how fantastic the art and culture scene can be in a small community like Lake Country: the art, the music, the theatre, the vintage wares, and the food. It is important that all this wonderful creativity is accessible to the whole community whether one engages by offering art or by accepting it." Vendor spots are still available, for the low prices of $10 for 5 ft or $20 for 10ft - take a look at our map of vendor spots for further details. The Lake Country Art Bazaar runs from 9:00am until 1:00pm on Saturday July 19th, followed by 3 other Saturday dates: August 9th, September 6th, concluding on October 11th. These events take place at the ArtHouse, located right next door to the Gallery, this cultural hub also shelters the Gallery Gift Shop and the Artshelf Used Book Shop which complements the Arts Bazaar beautifully. Already signed up to show their wares: Perch Travelling Boutique (vintage clothing), Nobert Spyth (glass), Rick Gibbs (glass), and artists Kara Barkved, Jolene Mackie, Sea Dean, Shannon Breadner, Leanne Spanza, and Denise Wandt; as well as appearances by the New Vintage Theatre company. “So far we have glass arts, fine arts, vintage clothing, theatrics, sparkling adornments and crafts. We hope that visitors will also be able to take home an edible treat to round off a truly magical trip into a creative wonderland and that they will want to return once a month with all of their friends and visitors throughout the summer”, explains McNeill. The second Lake Country Art Bazaar is Saturday, August 9th from 9am - 1pm. This event is free and open to the public.